If my wife’s experience is representative of cat owners, then the enjoyment of selecting, buying, and gifting of toys to one’s cats must be one of the great rewards of cat ownership. She buys on average a cat toy or two each month, a number that has dropped considerably from the early kitten days. Our oldest cat is 16 years old which is 192 months, and you can do the rest of the math. As you might imagine, Casa de Wyatt is awash in cat toys. My wife wants to replace the rugs but I say we should just sew all the cat toys together because when arranged in a single contiguous layer they would cover about the same surface area. There is some karmic justice in the idea because we wouldn’t need to replace the rugs if the cats had not scratched through them in places, puked up hairballs and worse on them, and occasionally subjected them to some out-of-the-box thinking. The cats of course are under no obligation to return their toys to where they found them. On the one hand this reveals cat migration patterns based on the distribution of toys around the house over time, if you are into that kind of thing. On the other hand it sets a very bad example for our grandson Matt who believes that he too should be able to play with all the toys he keeps here, then leave them where they drop. We insist that he pick up after himself and he interprets this as the cats having more privileges than he does. When I explain that with greater intellect comes greater responsibility, he counters by trying to demonstrate less intellect than the cats. This downward behavioral spiral vividly demonstrates the dangers of letting your kid, or grandson in this case, fall under a bad influence such as that of a gang of cats. The biggest problem I have with the cat toys is when strangers are in the house. I always feel compelled to explain that it just LOOKS like we are collecting cats because of the astronomical toy-to-cat ratio. My fear is that without such an explanation the visitor is likely to report us to the Humane Society or nominate us for an episode of Hoarders. After watching Ready Player One over the weekend I think I finally have the perfect cover story for any visitors based on how the cat toys tend to cluster in certain spots. I plan to tell visitors that each time a cat loses one of its 9 lives, all the coin and objects it was carrying fall in the spot where it died. 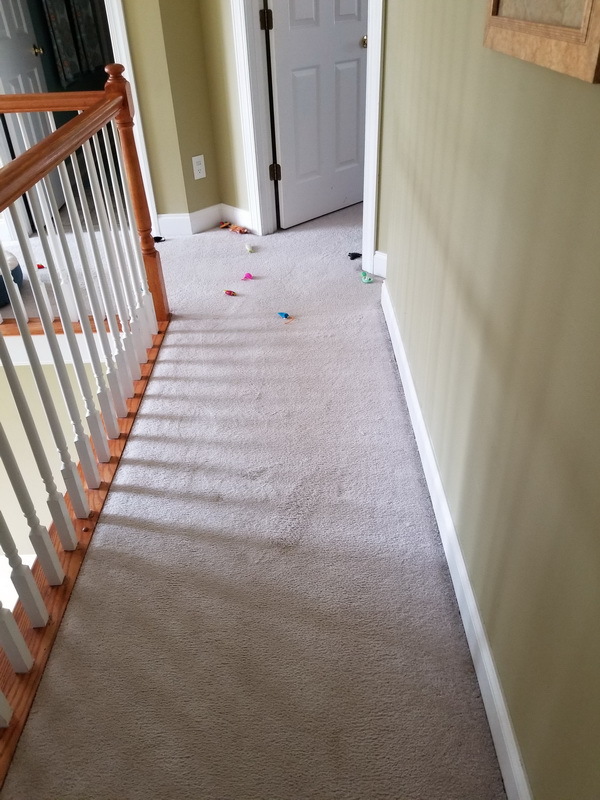 Those clusters of cat toys around the house mark the spots where a cat lost one of its lives. The sheer volume of toys reflects both the advanced age of our cats and the high number of lives they’ve lost in that time. Visitors will be asked to show respect for the dead by trying not to disturb the shrines and watching where they step. I have a lot less anxiety about strangers in the house now that I have a plausible cover story that explains all the cat toys in a way that makes us seem perfectly normal. This entry was posted in Family, General, Humor. Bookmark the permalink.